Saddam Hussein, Osama bin Laden…to the list of Arabic names that instantly equate “Muslim” with “terrorist,” now add Abulkasem, the never-seen menace around whom young Swedish playwright Jonas Hassen Khemiri weaves his play “Invasion!” Khemiri, whose two novels and three plays have made him (at age 32) already one of the most acclaimed writers of his generation, takes as his subject how easily language can be spun to confirm assumptions, to conjure false realities, and to block communication. How much more pertinent can you get? His writerly concerns clearly reflect political consciousness and an attention to the casual, often thoughtless racism that attends Western representations of Arabic cultures. But Khemiri also possesses a devilishly playful theatrical imagination, which is well-met by director Erica Schmidt, translator Rachel Willson-Broyles, and a nimble, energetic cast of four in the Play Company’s production at the Flea Theater. The show won an Obie award in May for best Off-Broadway play after a short run in the winter and is back for a return engagement through October 1. 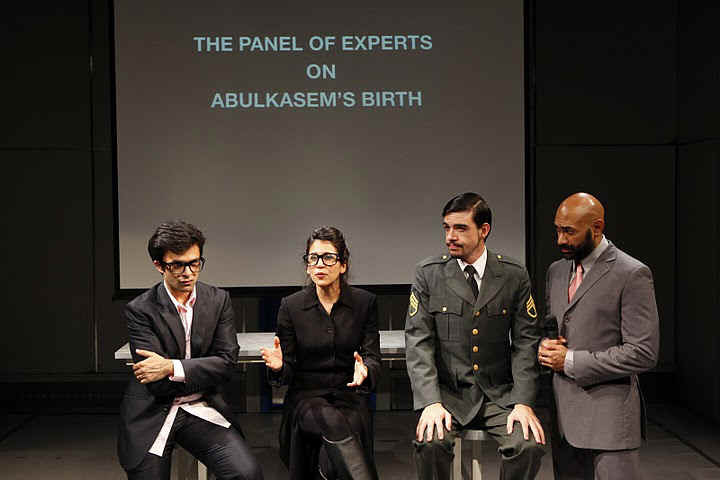 How Abulkasem makes his first leap from being a character in Carl-Jonas-Love Almqvist's 1835 play “Signora Luna” to contemporary New York City schoolyard slang relies on a surprise I won’t spoil (except to say that it demonstrates right off the bat how unnervingly easy it is to manipulate almost anybody). At first the kids treat the name as almost random syllables that take on any shade of positive or negative as noun, verb, or adjective. Then one of them (Bobby Moreno) remembers that he has an uncle by that name back in Lebanon (Andrew Ramcharaan Guilarte), who prefers to be called Lance and prances around in a feather boa and underpants. The other kid, nerdy Arvind (Nick Choksi), learns that some power accrues when he gives his name as Abulkasem when he’s trying to chat up a pretty girl in a bar, Lara (Francis Benhamou). She in turn pulls that name out of the air when she wants to win an argument with some fellow graduate students by referring to an obscure female Iranian theater director. Meanwhile, to get rid of Arvind, she’s scribbled on a napkin a phony phone number which he keeps calling, leaving messages that are bewildering to the recipient, an immigrant Arab apple picker who has to answer for his connection to this Abulkasem. Before you know it, Abulkasem has gone viral among the media, the military, and academia. If you can imagine a Peter Handke mash-up of “Zelig” with “Wag the Dog,” you’re halfway there. I was impressed with the playwright’s boldness. He’s not afraid to let one scene tear the previous scene to pieces and remake the stage. He’s willing to write in choppy chunks and end in mid-air, and he has a postmodern prankster’s sense of humor about form. I especially liked playing the pickup scene first from Arvind’s triumphant perspective, then from Lara’s point of view, where it takes a whole other turn. The three send-ups of panel discussions flooded with academic name-dropping seemed like at least one too many iterations of an already overused conceit. No reservations whatsoever about the smart, fast, disciplined performances, which have the bristling sketch-comedy meets rock-and-roll energy that you see in a lot of terrific downtown ensembles these days.